This is a sponsored post. As always ways, all opinions are mine. Happy Monday! How time is flying! I can't believe Nolan is graduating this Thursday from pre-K and will also turn 5 on Sunday. It's a bitter-sweet moment. I can't believe how quickly he is growing. I have been in supermom mode preparing for his graduation and planning his superhero themed birthday. I got this raspberry suit for his graduation and he plans to dress up as "Spiderman" for his birthday (I will have dig out this costume from his toy boxes...wish me luck!). Today's look is another work style for spring and summer. Adding a pop of color and fun details is a great way to spice up your work style this season. I am a big fan of pencil skirts for work. 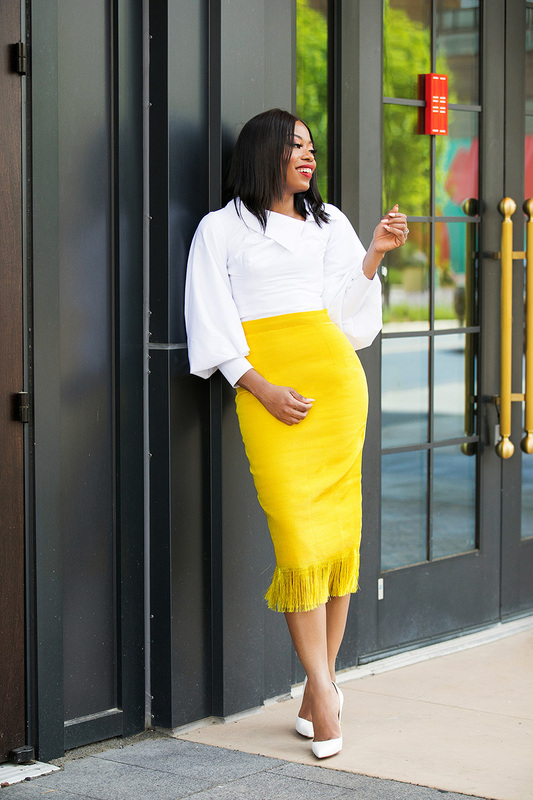 This yellow midi skirt with frayed hem adds a fun and unique twist. 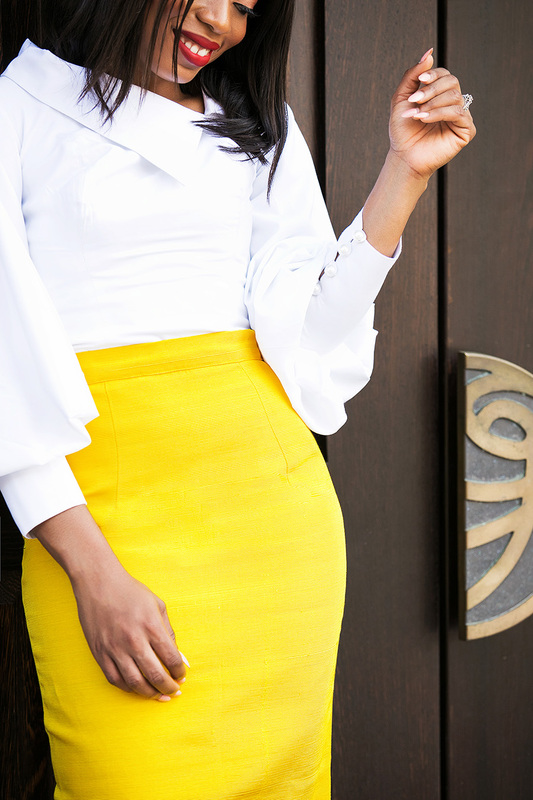 With a bright colored skirt, pairing it with neutral top creates a subtle feel and makes for a great look for work. Besides my obsession with white at the moment, I can't get enough of structured shirts. This ForStyleSake exaggerated sleeve shirt is definitely a favorite right now. From the collar details to the button details on the sleeves, this shirt is statement piece and not you typical work style.. It can be styled for work as seen in today's post or causally with jeans (as seen on my Instagram story and soon on the blog). 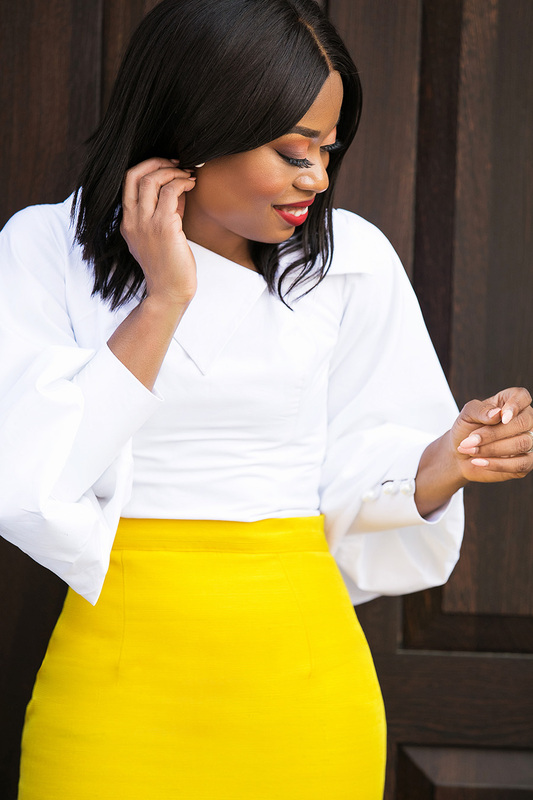 Obsessed with this fun yellow color!